Navigating the United Nations business is complex, however, navigating personal relationships can be just as difficult. Mark Sanders knows this as much as anyone else. Remembrance of Blue Roses begins at the Metropolitan Museum of Art, which is telling considering that this short novel revolves around a group of companions who value artistry considerably more than others do. Coming across his old friend Mark as he is casually working on a painting, Hans Schmidt excitedly introduces his wife. Immediately, sparks fly between Hans's wife, Yukari and Mark. This trio finds connection and promise of their future through love of art and classical music. "Call it friendship, love, love-triangle, or lunacy. I didn't care. I felt intoxicated by our delicious closeness." As they embark on a strangely intimate and loving friendship, the reader is able to understand Sanders' inner dialogue, which oftentimes reeks of sexual tension and confusion about his relationship with both Yukari and Hans. When tragedy forces itself into their lives, Mark must make adjustments to his life plans while maintaining hope for the future of his peculiar family. Although the author does not spend considerable time discussing the sexual relationships of the characters, it certainly makes brief appearances in the book, making this book appropriate for adults. 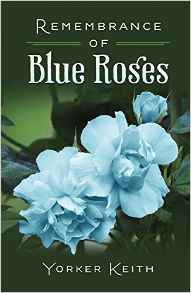 Remembrance of Blue Roses is an easy reading romance, however it still holds the reader's interest while it explores aspects of infidelity, career and family, parenthood, and the effects of terminal illness. As the characters explore these themes, readers will be drawn into their relationships and the unique environment which they live in. A thrilling ride in the unique art community setting, readers will consume this artistic display of the written word. Well done! "Call it friendship, love, love-triangle, or lunacy. I didn't care. I felt intoxicated by our delicious closeness"